Honestly, I’m not trying to be a jerk, but stop clicking on the thread. This thread has a life of its own. Edit........kinda agree on the Florida part. Does it matter? Will this one player destroy the TN football program? No sir, but no sense in bashing the kid. Fair and Sherrer botched it. Time to move on. You aren't helping the kid by bashing the coaches. It makes y'all look bitter and childish. I believe the staff took the better player and the Russell camp got left out. Pretty easy to see what happened really. Do tell... Because this thread isn’t going anywhere until people know what really happened. His Film is not bad, and he may turn out to be a great player. In the end, it worked out for everyone involved. Pennywise from the Dyersburg sewer. Well, since you have a clue, tell us what the TN coaches did that was so bad he chose not to take his visit. Not buying that they were stupid enough to say something bad about him in a public restaurant. Mark Richt has lost control of this thread..........again. "Well make up your mind dude, is he gonna sh!t or is he gonna kill us?" It sounds like you're claiming to have very detailed information. If so, then tell us. It is my belief but IF we were interested in him at all then he slow played this to the extent that he did not any longer have a place in the recruiting roster. Everybody in the world knew we were getting short on Spaces and if he missed out, then he just overplayed his hand. That happens to everybody who sells cars. Is hard to sell someone a Chevy Cavalier when someone else is offering a Mercedes for the same price. 50% of volnation still live in the 90s, think we are relevant, and think kids should feel privileged to come here. 25% still hugging Butchs nutz. The other 25% are realist. You sir are part of the 50. 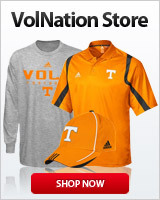 You dont bring anything to volnation. All you do is bash kids when they dont want to come to UT, and bash people on these pages when they try to bring info. It sounds like you're claiming to have very detailed information. If so, then tell us. It is my belief but if we were interested in him at all then he slow play this to the extent that he did not any longer have a place in the recruiting roster. Everybody in the world knew we were getting short on Spaces and if he missed out, then he just overplayed his hand. That happens to everybody who sells cars.